New York: Random House, 1961. First edition of the author's masterpiece. Octavo, original cloth. Presentation copy, inscribed by the author on the half-title page to her editor, "Best wishes to a splendid publisher and friend, David Kent. And a splendid dinner date, Affectionately Jane Jacobs Toronto Jan. 2002." Fine in a very good dust jacket with some rubbing and wear. An outstanding association copy on one of the most influential books on urban planning ever published. The Death and Life of Great American Cities was described by The New York Times as "perhaps the most influential single work in the history of town planning. . . . [It] can also be seen in a much larger context. It is first of all a work of literature; the descriptions of street life as a kind of ballet and the bitingly satiric account of traditional planning theory can still be read for pleasure even by those who long ago absorbed and appropriated the books arguments." Robert Caro has cited Jacobs' book as the strongest influence on The Power Broker, his Pulitzer Prize-winning biography of Robert Moses. New York: Random House. Fine in Near Fine dust jacket. 1961. First Edition. Hardcover. Slight tanning to the spine, otherwise a fine copy of what many consider to be the most important book on urban planning of the 20th century. In protective Mylar cover and shipped in a Multi-D box to prevent corner-bumping. Danbom and Son Books is a member of the Rocky Mountain Antiquarian Booksellers Assn. ; 8vo 8" - 9" tall . New York: The Modern Library, 1993. First Modern Library edition of the author's magnum opus. Octavo, original cloth. 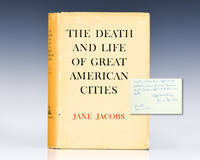 Signed by Jane Jacobs on the half- title page. Fine in a fine dust jacket. The Death and Life of Great American Cities was described by The New York Times as "perhaps the most influential single work in the history of town planning. . . . [It] can also be seen in a much larger context. It is first of all a work of literature; the descriptions of street life as a kind of ballet and the bitingly satiric account of traditional planning theory can still be read for pleasure even by those who long ago absorbed and appropriated the book's arguments." Robert Caro has cited Jacobs' book as the strongest influence on The Power Broker, his Pulitzer Prize-winning biography of Robert Moses. New York: Modern Library, 1993. First Modern Library Edition. Octavo; VG/VG; Gray cloth boards and spine; Jacket Gray with black lettering; Boards and binding strong, minimal shelf wear; Text block clean; Book has been SIGNED by Jacobson the title page. 598 pages. Shelved in Case 1. Shelved Dupont Bookstore. New York: The Modern Library, 1993. Hardcover; 598 pages in good condition. Signed by Jane Jacobs on title page. Grey cloth hardcovers with gilt titles on spine. Part of titles rubbed off. Skewed binding. Fading around edges. Clean endpapers. The pages are white. Four pages dog-eared with sparse pencilling. (G) The jacket is silver with black text. Moderate shelfwear. Slightly sunned spine. (G+). By Author. Hardcover. Good/Good+. Random House, 1961. second printing. Acceptable. Signed by Jane Jacobs. "Cordially, Jane Jacobs, Feb 1962" No dust jacket. Some separation of fron cover at the spine. Surface, shelf, and corner wear, and some water staining. Still, certainly a readable copy. Vintage. Hardcover. POOR. Noticeably used book. Heavy wear to cover. Pages contain marginal notes, underlining, and or highlighting. Possible ex library copy, with all the markings/stickers of that library. Accessories such as CD, codes, toys, and dust jackets may not be included. NEW YORK: RANDOM HOUSE, 1961. 1st Edition 2nd Printing. Hardcover. Fine/Good. 8vo - over 7¾ - 9¾" tall. 458 Pp. COPYRIGHT 1961. FIRST EDITION. SECOND PRINTING. THIS BOOK IS AN ATTACK ON THE CURRENT METHODS OF CITY PLANNING AND RE-BUILDING. BOOK DESCRIPTION: BLACK/BROWN CLOTH HARDBOUND, GILT SILVER/RED STAMPED/EMBOSSED TITLE ON SPINE COVER, ILLUSTRATIONS, MANILA DUST JACKET WITH BLACK/RED STAMPED TITLE. DIMENSIONS: 9 1/4" x 6 1/4" x 1 3/4." BOOK CONDITION: FINE. DUST JACKET CONDITION: SUNNED DUST JACKET, SPOTTED, SOILED, AND LIGHTLY CHIPPED SPINE CROWN/HEEL, AND TORN AT CENTER HINGE AREAS OF SPINE PERIMETER AREA. London: Jonathan Cape, 1962. Illus. DJ with chips, small tears and tanning, purple quarter-cloth, coloured top, light marks to bottom edge, 458pp. 1st UK Edition 1st Printing. Hard Back. Good/Good. 30 x 150 x 220 Mm. New York: Random House, (1961) First edition. 8vo; 468 pp. Short tear to top of spine; else a very good copy in original gilt-stamped black cloth, in a dust jacket with chipping to top of spine. Jacobs's famous attack on post-war city planning, urban renewal, and rebuilding..
1993-04-08. New. Ships with Tracking Number! INTERNATIONAL WORLDWIDE Shipping available. Buy with confidence, excellent customer service! 1992-06-03. New. Ships with Tracking Number! INTERNATIONAL WORLDWIDE Shipping available. Buy with confidence, excellent customer service! Penguin Books Ltd, 1972-07-14. Paperback. Good. 2002-02-04. Good. Ships with Tracking Number! INTERNATIONAL WORLDWIDE Shipping available. May not contain Access Codes or Supplements. May be ex-library. Shipping & Handling by region. Buy with confidence, excellent customer service! Randon House, 1961. Hardcover. Good. First edition first printing. No dust jacket. Previous owner's name in pen. Slightly loose hinge. 1961 Random House first edition, second printing. Jacobs' book has the reputation as being the most influential book written about Urban Planning in the 20th Century. Condition of the book is Near Fine. The binding is straight and sound. Inside pages are complete and unmarked. The book has no significant condition issues, a very nice copy. Condition of the dust jacket is Very Good. The DJ is complete, not price clipped. It shows moderate shelf wear. The DJ is protected in a new mylar cover. Please message me with any questions. Random House, 2002-09-10. Hardcover. Used:Good. Rochester, VT: Town of Rochester, VT. Near Fine/Near Fine. 1975. 1st. hardcover. 4to . 220pp . NO INTERNATIONAL OR PRIORITY. Very nice copy. .
Vintage Books :. Used - Acceptable. Acceptable condition. Mass Market Paperback edition. Spine is cracked. Slightly dampstained. A Vintage Book. Used - Good. Good condition. Writing inside.Slightly dampstained. Viking Pr, 1984-06. Paperback. Good. 2011-04-07. Good. Ships with Tracking Number! INTERNATIONAL WORLDWIDE Shipping available. May not contain Access Codes or Supplements. May be ex-library. Shipping & Handling by region. Buy with confidence, excellent customer service! Random House. Hardcover. 0375508732 Very Good, mylar-wrapped dust jacket. . Very Good. 1989. Vintage. MASS MARKET PAPERBACK. 0394702417 New Condition. . New. Modern Library. Hardcover. 0679644334 New Condition. . New. Modern Library. Hardcover. 0679600477 New Condition. . New. MODERN LIBRARY. New. 7.66 x 5.21 cm. Modern Library. Hardcover. 0679644334 New Condition *** Right Off the Shelf | Ships within 2 Business Days ~~~ Customer Service Is Our Top Priority! - Thank you for LOOKING :-) . New. Viking Pr. Paperback. POOR. Noticeably used book. Heavy wear to cover. Pages contain marginal notes, underlining, and or highlighting. Possible ex library copy, with all the markings/stickers of that library. Accessories such as CD, codes, toys, and dust jackets may not be included. 1992-06-03. Good. Ships with Tracking Number! INTERNATIONAL WORLDWIDE Shipping available. May not contain Access Codes or Supplements. May be ex-library. Shipping & Handling by region. Buy with confidence, excellent customer service! Modern Library. Hardcover. 0679644334 Like New Condition. . Fine. [New York]: Random House, 1961. Third Printing. Hardcover. Very Good/Good. 8vo - over 7¾" - 9¾" In tan jacket over clothbacked boards, , 458,  pages. (shelfwear, browning and general soiling to outer jacket extremities; sm. nicks and short tear to jacket at tips and corners, name to endpaper). Modern Library, 2011-09-13. Hardcover. Used:Good. In Stock. Always but with confidence. Vintage. PAPERBACK. 067974195X New Condition *** Right Off the Shelf | Ships within 2 Business Days ~~~ Customer Service Is Our Top Priority! - Thank you for LOOKING :-) . New. Vintage Books. Used - Good. Good condition. Stamped on inside. Modern Library. Hardcover. 0679600477 Like New Condition. . Fine. Random House . softcover. New. Pimlico. PAPERBACK. 0712665838 Brand New ,Original Book , Direct from Source , Express 5-8 Business days worldwide Delivery. . New. Vintage. Used - Good. Ships from the UK. Former Library book. Shows some signs of wear, and may have some markings on the inside. 100% Money Back Guarantee. Your purchase also supports literacy charities.